CertBlaster, through its mother company dti Publishing Corp., is proud to be a CompTIA Authorized Partner and part of the CompTIA Authorized Partner Program (CAPP). CompTIA considers its Learning Content partners as one of their most important strategic assets and allies and as such the CertBlaster product line benefits from the support CompTIA provides. CompTIA works with partners like CertBlaster to help market the highest-quality learning products to IT professionals worldwide. CompTIA is an internationally recognized provider of high-quality, vendor-neutral certifications for IT professionals. CompTIA works with multiple Learning Content channel partners such as CertBlaster around the world to help IT professionals advance their knowledge, skills, and career credentials in order to raise workplace performance levels. Internationally recognized vendor-neutral certifications validating proficiency in networking, security, PC repair, server technology, project management, green IT, and other information technology subjects. Over 2 million CompTIA certified IT professionals worldwide, with one million being CompTIA A+® certified. Recognized by top IT companies such as Microsoft, HP, Sharp, Ricoh, and Lenovo. Recognized by the U.S. Department of Defense (DoD see Directive 8570), which mandates four (4) CompTIA certifications for IT competency: The CompTIA A+®, CompTIA Network+®, CompTIA Security+ ™, and CompTIA Advanced Security Practitioner (CASP) certifications. Creator of multiple industry resources-such as the CompTIA Career Center, IT Pro Community, and research reports-to help our partners, companies, IT professionals, and government organizations. Participation in government initiatives and programs to create jobs, extended careers, and improve IT workforce performance through multilayered workforce development initiatives. 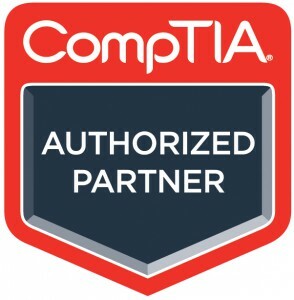 The CompTIA Authorized Partner Program recognizes CertBlaster as a highly valued CompTIA business partner. CompTIA defines CertBlaster Learning Content as materials in which courseware is available for self-study, eLearning online interactive training used as self-study, pre- or post-classroom training, and certification preparation tools which validate learning and prepare students for certification tests. The management of dti Publishing has deep roots in CompTIA certification. The president of the company was one of the original founding members of the A+ certification track and sat on the first A+ Executive Committee even before the release of the first version of the exam. Since then he has also participated in the Network+, Security+ and Server+ committees. The company’s Director of Content is a Subject Matter Expert (SME) for both A+ and Network+. We have also served on the CompTIA Candidate Appeals Committee where decisions are made on candidate that appeal thir exam results. Additionally all the CertBlaster independent authors are CompTIA certified in their respective fields of expertise.